The DYNCO is the first fully dynamic orthosis (also called spalk or brace) in the world for children with clubfoot as part of the Ponseti treatment method. 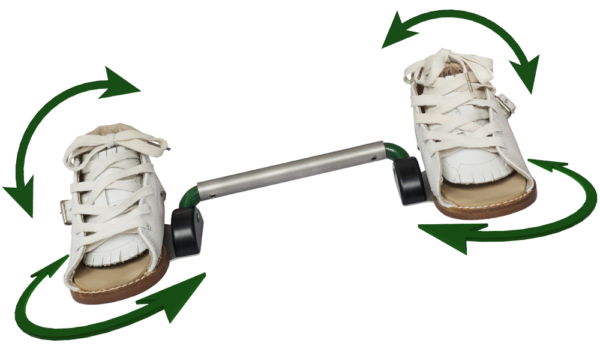 The DYNCO (a acronym for DYNamic Clubfoot Orthosis) allows all movements of the feet, so rolling, crawling and even walking are just possible, while a clever spring causes the feet to be rested to the desired position for treatment. The DYNCO is available in four sizes. With the growth of the child, the feet must be further separated. The feet should be kept about shoulder width. Therefore, a larger DYNCO is required. In addition, the child’s strength increases with growth. Therefore, in each consecutive DYNCO there is also another (stronger) spring, so that there is a good balance between allow moving and correct when possible. The DYNCO can be combined with Markell shoes and Semeda shoes. 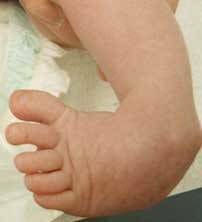 The clubfoot is a congenital foot disorder and occurs in about 1 in 800 newborns. The cause of clubfeet is not entirely clear yet. Heredity factors likely play a role. Clubfeet affects boys nearly twice as often as girls. Download here an artikle about the DYNCO. Download here an information form about the DYNCO. 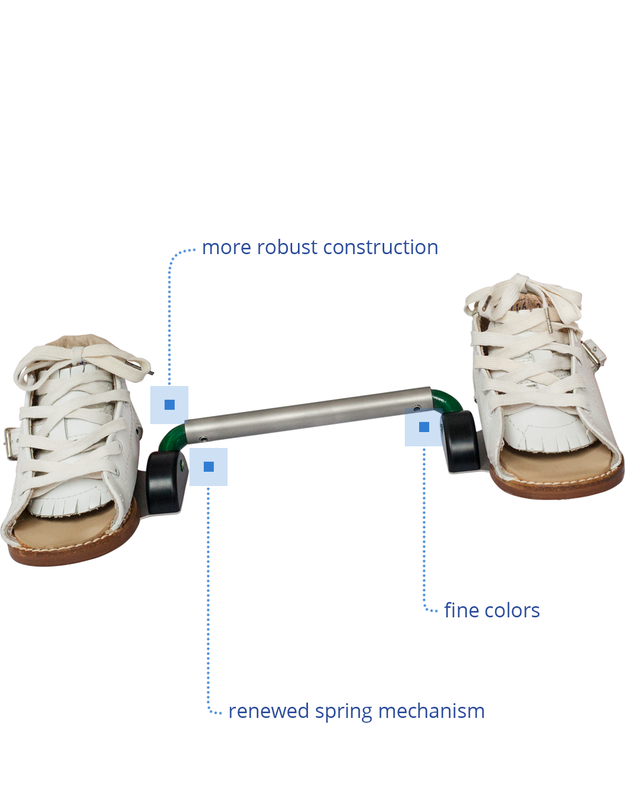 The DYNCO is Ambroise’s dynamic clubfoot orthosis. This splint can be used as part of Ponseti treatment. The Ponseti treatment usually starts very soon after birth. After a series of casting remedies (with the use of casting correction, the foot is moved to the desired position), often followed by an operation where the achilles tendon is cleaved. After this operation, the child must wear an orthosis (brace or splint) for about three months, 23 hours a day. Afterwards, this brace must be worn as a night splint until about four years of age. A controversial solution to reaching all of this is a Denis Browne spalk. That is essentially a bar that secures the feet to the desired position. The disadvantage of this orthosis is that it is static and rigid. With other words, there is no movement of the feet in relation to each other. This impedes the mobility of the child (and his motor skills). In addition, during sleeping it is very annoying, especially if the children have learned to turn around and sometimes lie down on their side. More robust construction The frame and the spring are mounted in a smarter way and are therefore less susceptible to breakage. Renewed spring mechanism The new spring is made of even more durable material that can withstand more impact. Fine colors The club foot orthosis is made in the Ambroise company colors and is therefore recognizable as a product from our own orthosis line.